Recently, I read some sad news, Carbon Motors has folded. I can’t say I’m surprised. Starting a car company, especially a niche car company is hard. It is sad because E7 concept seemed really thought out, and that’s what I liked about it. I’m a bit disappointed I didn’t write more about Carbon Motors three years ago when they first showed up on my radar. The E7 was was billed as the only purpose built police car in the world. The front seats had cutouts for utility belts and a sucky to blow cool air on the driver’s neck. The rear seats had suicide doors and seatbelts rigged with the latches records the outside so that officers didn’t have to lean over prisoners when securing them in the back. The car also was supposed to come full of gadgets like nightvision cameras and NBE detectors (no doubt to enable police departments to offset the cost of the vehicles through antiterrorism grants). Apparently getting enough orders and/or bringing the manufacturing cost down for profitability became a problem for Carbon, because they eventually ditched the patrol car, and started shopping around a rather boring paddy wagon. Sadly, Carbon Motors’s online presence is completely gone, save for the wayback machine. A salvaged picture of the paddy wagon is after the jump. This entry was posted in installation / sculpture, tech and tagged automobiles, carbonmotors, policecars on April 23, 2013 by jonathan. NC State industrial design grad student, Joe Harmon is building a car by hand. Not just any car. A sports car that can reach 240 MPH. Not just any 700 HP, 240 MPH sports car. 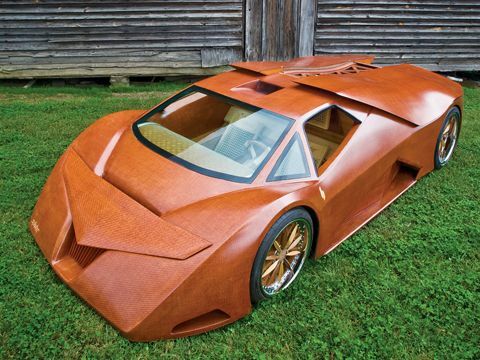 A 700 HP, 240 MPH sports car made almost entirely of wood. 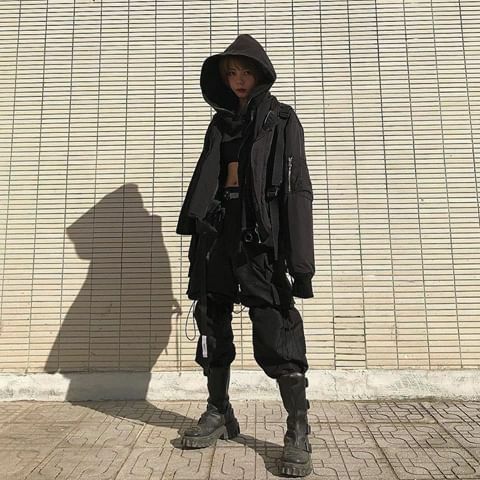 The body? Wood. The dash? Wood. The seats? Well, they’re wicker. The wheels? Oh, they’re wood too. The suspension? Yes, it’s wood too. Because he wants strength, but also a reduced weight (wood has a higher strength-to-weight ratio than steel or aluminum), he is creating the body out of custom made plywood that consists of layers of eighth inch wide cherry veneer strips that are then weaved together, and glued on top of a weaved birch veneer, a core of balsa wood, and then another woven layer of birch. The panels are then vacuumed formed into shape, using the same technique that’s used for carbon-fiber composites. All told, about 30 species of wood are used to make up the car. According to the last update, which was about a year ago, the outer shell was complete, but the internal components such as the V8 Cadillac Northstar engine and six speed Corvette transmission were yet to be installed. However, the car has drawn industrial sponsors like Delta/Porter-Cable, and has been making the rounds at different car shows. This entry was posted in installation / sculpture, tech and tagged automobiles, joeharmon, woodworking on December 29, 2009 by jonathan.